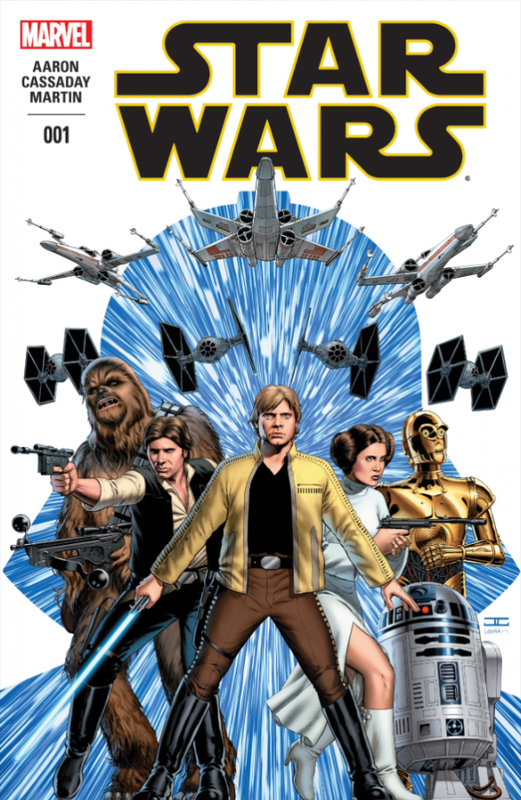 You could be forgiven for missing the fact that Marvel’s Star Wars #1 hit the shelves a couple of weeks ago. In a year that will be fit to bursting with Star Wars hype left right and centre, it was strangely muted on my Twitter and elsewhere that this book was being launched. I would be curious to see how the sales stacked up. The owner of my local comic book store told me that there were a mind-boggling 15 or so variant covers, so Marvel were obviously expecting a fair amount of rabid fan interest. I grabbed a copy when I saw it down at the local. I didn’t take notes or anything whilst reading through, but here are some brief thoughts on what I liked and what I didn’t. Anyone else read this? The art on feature panels/pages (Vader’s first appearance, the final page) is really sharply done and suggests the grandest moments of the films. Atmosphere – this feels like a Star Wars story. There is a comforting familiarity to it that is not present in the worst Star Wars productions. The tone – whilst it feels like Star Wars, something is just slightly off about the tone. The lightness or comedic shading not quite right. Han’s interactions with C3PO for example, really don’t zing like they should. Some of the panels outside of the feature ones I mentioned above range from the bland to the downright shoddy. The comic is a victim of its construction. The fact it takes place immediately following episode IV means that whilst the beats will be unfamiliar, there is little tension in terms of the overall arc. We know where this story and where all of these characters end up. That’s not fatal, many prequels have the same issue. But future issues will need to overcome this to make it feel fresher and more necessary. Related beermovie.net articles for you to check out: Comics Review: 24 Undergound issues 1-5 and Comic-Con Episode IV: A Fan’s Hope.